The web is buzzing with back-to-school deals, tips, and must-have accessories to kick Fall 2014 off right. Shopping for the best gadgets or just trying to find the most stylish & smartest ways to protect them? Look no further. Browse through the Back-to-School Tech Guide from CNET to see which of their smartphone, tablet, and laptop suggestions match our mighty slim cases. Gear Diary tipped off its readers with a special Apple store gift card deal for student shoppers- giving $100 back to Mac buyers (MacBook Air, Pro, or Retina display? Yep, we’ve got them covered). In the meantime, let’s be grateful that technology has made these 8 school supplies completely obsolete – thanks Mashable! Celebrate your student’s Class of Color with Speck this fall! 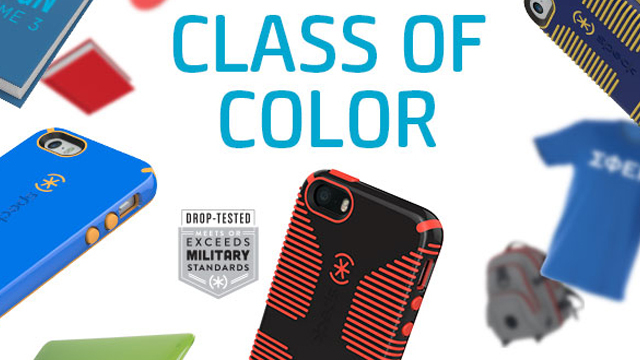 Shop our slim, protective lineup of military-grade cases to send you back to school in style.